Lavender is a native of the lower Alps bordering on the Mediterranean, and this region is still the main centre for lavender oil production today, although English lavender oil is famed for its quality. The Romans used lavender flowers in their public baths, and this has given rise to the name of the plant, from the word ‘lavare’ meaning to wash.
At Pots & Potions, we like to include (French) lavender oil in our preparations on account of its soothing and relaxing qualities. That, and the fact we like the smell. 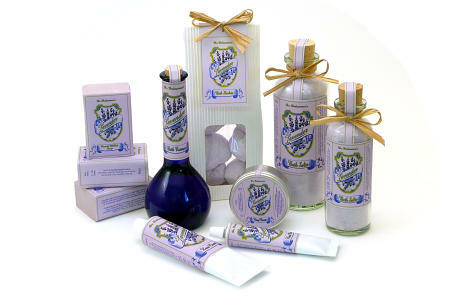 Click on the links below to find out more about our lavender scented products. Our lavender and Windsor Rose hand creams are also available in our elegant porcelain pots. Eacl lid is decorated with a cobalt blue design and presented in a matching blue box.